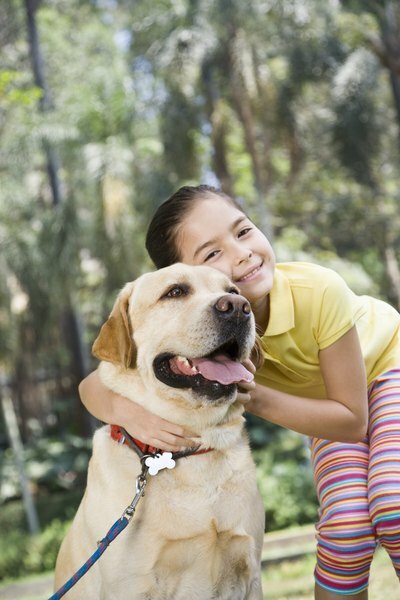 Labs are on the list of kid-friendly dog breeds. Kids and puppies seem to naturally go together. It can be good for a child to have a pet to help care for, but don't just run out and bring home the popular breed of the moment. Pick a dog from a list of breeds that are good with kids. The American Kennel Club describes labradors as intelligent and family-friendly. They're excellent companions for kids school-aged and older because of their high energy levels -- many times a dog and the children are the only ones who can keep up with each other. Labs are known to be affectionate, gentle and protective, too, and can adapt to toddlers and small children well. Collies are loyal family dogs that, although large and active, do well with children. They are attentive and responsive. Easily trained, they adjust well to family life with children. With a moderate energy level, they enjoy play and exercise with the kids, but can just as easily adapt to less activity. Many smaller breed dogs aren't appropriate for homes with children because of their size and needs, but if you're looking for a small dog that will be a good companion for your child, the bichon frise is the dog for the job. These happy, playful little dogs are also quite gentle, making them suitable for homes with children of all ages including toddlers and babies. Beagles are another dog of smaller stature who will happily join a family that includes children. Their short coats make them low maintenance and their cheerful, affectionate nature makes them pleasant friends for the kids. Vet Info notes the stubborn streak in the beagle breed, but advises proper training to override that, making them into faithful companions. Dogs breeds that are known to be aggressive or have low tolerance levels don't typically make good family pets when the family includes children. They won't put up with rough handling or play from a child whether intentional or not, resulting in an unhappy ending. Breeds that are known to be aggressive and therefore should be avoided by families with children include sharpeis, rottweilers, Staffordshire bull terriers and wolf hybrids. There are always exceptions to the rule and you may find an exceptionally gentle and loving doberman pinscher (also considered too aggressive for children), but steering away from breeds known to have a low tolerance for children is a safer bet than hoping an aggressive dog can learn to live with kids.